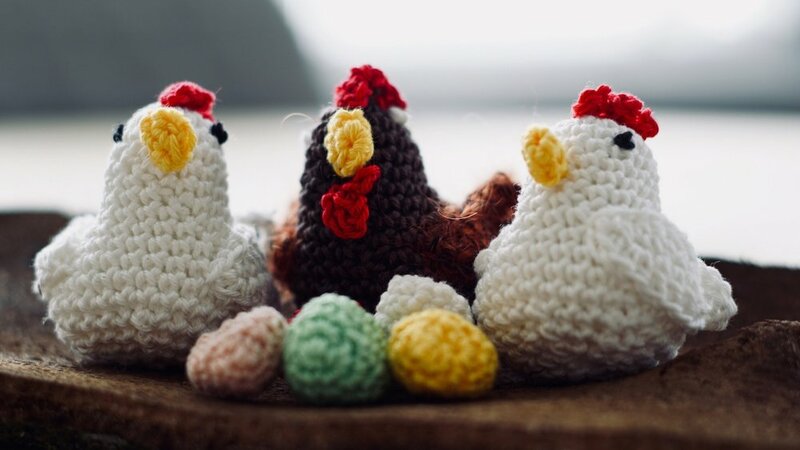 I can’t believe this weekend is Easter already! Actually, it seems really late this year, but it still managed to sneak up on me! I decided it was appropriate to write a recipe post for my favorite healthy egg salad! My egg salad is special. You see, I’m an egg salad girl at heart. But I’m also a ham salad girl. 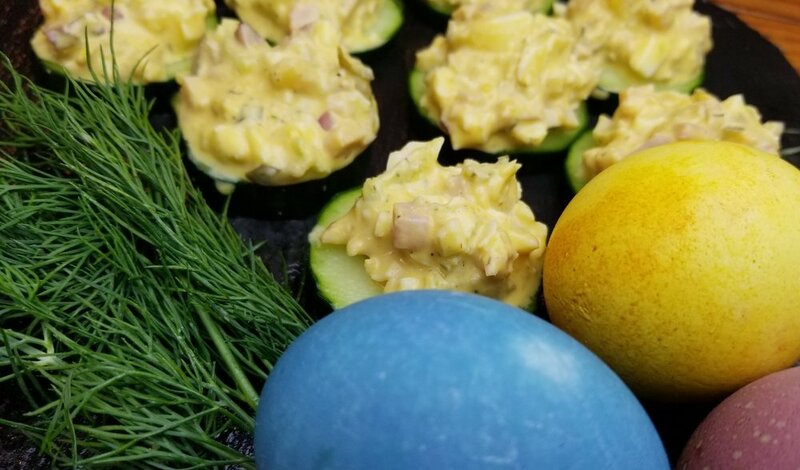 And since both eggs and ham seem to be prevalent during Easter, I thought: why not combine the two to make a dynamite, protein-rich, healthy egg salad?!? Genius! Okay, so maybe egg salad is only healthy-ish. Cucumbers are veggies, and eggs are loaded with protein and healthy fat! Plus, my secret ingredient is Great Lakes Collagen, which adds an extra dose of appetite-suppressing protein. Either way, it’s really delicious, and worthy of a party appetizer or just an easy snack! So if you need something to do with all those Easter eggs that you spent eight days coloring with your homemade natural dyes (yes, this happened at my house – you can see more about that on AkronOhioMoms.com)…this is it! On to the recipe! Healthy egg salad cucumber rounds make a great snack! Add cooled and peeled eggs to a medium-sized bowl. Mash them up with a fork. Add the mayo, mustard, relish, seasonings, Tabasco, and collagen, and mix well with the eggs. Add the ham, celery, and red onion. Mix until well combined. Let sit in fridge for at least one hour. Slice the cucumber. Put a dollop of egg salad onto each cucumber round and serve as an appetizer or healthy snack! This egg salad is also great on toast or in a wrap! Want a printable PDF of this recipe? CLICK BELOW! Click Here For A Printable Recipe Download! I like a super creamy egg salad. If you prefer yours a little more “dry”, you can add more eggs and/or reduce the amount of mayo, mustard, and pickled dill. This recipe can easily be doubled if you need more, or cut in half, if you need less. The collagen hydrolysate powder adds extra protein without changing the taste or texture of the dish. This ingredient is optional, but it’s one of the ingredients that turbo-charges this healthy egg salad! You can buy Great Lakes Collagen Hydrolysate on Amazon. You can modify this recipe to your liking! Remember that no recipe is set in stone. Add, omit, or change spice ratios to your taste. If you don’t like ham, omit it, or try replacing with bacon, or even diced crab or chicken! I choose to use avocado oil mayo because every other mayo on the market contains highly processed and inflammatory oils like soybean, canola, and vegetable oil. But regular mayo can easily be used in place of the “Paleo” mayo. If you’re not digging the ultra-healthy vibe of egg salad on a vegetable, go ahead and slather some on a piece of hearty whole grain toast or a whole wheat wrap – still delicious…and still pretty healthy! Egg salad will keep for about 5 days in your fridge. Portion it into smaller containers and you have an easy grab-and-go lunch or snack option! Thanks for reading and have a Happy Easter!